The Australian Brush-turkey, also frequently called the Scrub Turkey or Bush Turkey, is a common, widespread species of mound-building bird from the family Megapodiidae found in eastern Australia from Far North Queensland to Illawarra in New South Wales. It has also been introduced to Kangaroo Island in South Australia. It is the largest extant representative of the family Megapodiidae and is one of three species to inhabit Australia. Despite its name, the bird is not closely related to American turkeys. 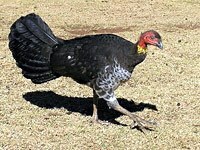 What do Australian Brush-turkey look like? The bird's wattle (a fleshy lobe hanging down from the base of its neck) varies in colour with its age, gender and location. 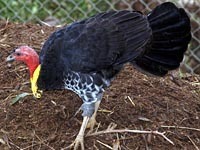 In the southern parts of its range, the male brush turkey has a bright yellow wattle, while on Cape York Peninsula in far north Queensland its wattle is light blue. 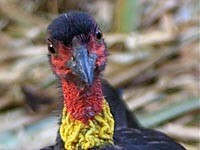 Females and younger birds have dull yellow wattles. Brush turkey chicks look much like quails, with plain rich brown feathers over their entire bodies. As they mature they lose the feathers on their heads and necks, where the bare skin turns a deep pink colour. How large is an Australian Brush-turkey? It is a spectacular large bird with a total length of 60–75 cm and a wingspan of about 85 cm. Where do Australian Brush-turkeys live? 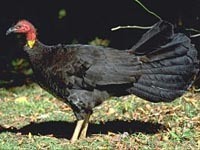 The Australian brush turkey can be found in NSW and Queensland. It lives in humid forests along the eastern seaboard and inland to the wetter ranges, though it is most often seen in rainforest and neighbouring eucalypt forest areas. It remains in a particular locality throughout the year, where it breeds and forages in the forest leaf litter for fruits, seeds and small animals. This fascinating bird is abundant in favourable habitats. However, since European colonisation its numbers have declined - particularly near cities. In places where it shares its breeding and foraging grounds with humans, the survival of the species depends largely on the goodwill of householders. What animals eat Australian Brush-turkey eggs? 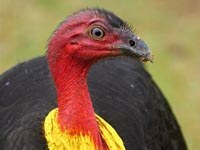 Download free Australian Brush-Turkey wallpapers, click on the image to open the large version. Print free Australian Brush-Turkey coloring pages, click on the image to open the large version.